Located in the heart of the Old Town, Museo Picasso Malaga is a monumental tribute to an exceptional local talent: Pablo Picasso. Browse the nearly 300 works by the world-famous painter and sculptor. See early 19th-century sketches of landscapes, cubist impressions and modern 20th-century portraits. While here, also admire the grand setting for the museum, the elaborate 16th-century palace called Palacio de Buenavista. Pablo Picasso was born in Malaga in 1881 and grew up in the town. His later visits to his hometown were fleeting, but the connection was there for life. As this museum reveals, in 1953 Picasso expressed his desire for his work to be showcased in his home city. He died 20 years later, before the museum was achieved. In 2003 his wish was finally granted. The museum’s collection covers eight decades of Picasso’s varied artistic career. The works were mostly donated by, and partly borrowed from, the artist’s heirs. Browse the extensive galleries with Picasso’s earliest childhood sketches, preliminary drawings, sculptures, ceramics and etchings, groundbreaking modernist paintings and final works completed in the 1970s. Picasso changed the way people looked at art forever and is now universally called a master painter. From his early academic studies to his revolutionary innovations in cubism and primitivism, Picasso stood out. To further your understanding of Picasso’s influence on modern art, browse the art history books in the expansive Picasso Museum Library and Bookshop. Stop by the Picasso Museum Café on your way out and enjoy a typical Andalusian treat or glass of Spanish wine in the garden. Return in the evening for a seminar, poetry reading or music recital. The Picasso Museum Malaga is open daily, except Mondays, New Year’s Day and Christmas Day. The museum stays open in the early evening. There is a small admission fee, except in the late afternoon on Sundays. The museum is close to the bus hub of Paseo Parque. Trying out a Museo Picasso Málaga Admission & Sherry Tasting will make the visit to this famed attraction a day to remember! For even more activities, check out our Centro things to do page. After construction workers uncovered this 2,000-year-old ruin in 1951, careful restoration brought it back to a fully functioning open-air theater. One of Spain’s most popular cruise ports is a great place to experience the atmosphere and history of lively, welcoming Málaga. Experience the timeless allure of delicately crafted decorative arts at this private collection housed within a restored 18th-century palace in San Felipe Neri. 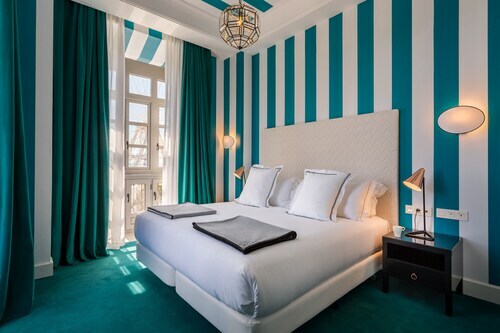 Located in Centro, this boutique hotel is steps from Palacio Episcopal, Malaga Cathedral, and Calle Larios. Port of Malaga and Picasso Museum Malaga are also within 10 minutes. La Marina Station is only a 3-minute walk and Guadalmedina Station is 11 minutes. 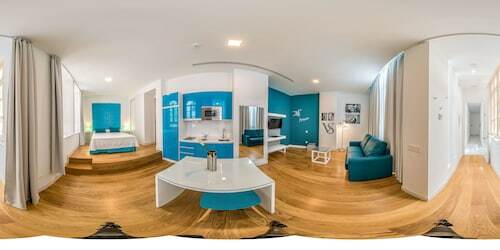 Located in Centro, this apartment building is steps from Picasso Museum Malaga and Malaga Cathedral. Alcazaba and Port of Malaga are also within 10 minutes. La Marina Station is 7 minutes by foot and La Malagueta Station is 13 minutes. Located in Centro, this apartment building is within a 10-minute walk of Central Market of Atarazanas, Port of Malaga, and Calle Larios. Malaga Cathedral and Picasso Museum Malaga are also within 15 minutes. La Marina Station is only a 5-minute walk and Guadalmedina Station is 8 minutes. This family-friendly Malaga hotel is located near the beach, within a 5-minute walk of Plaza de Toros de la Malagueta and Malagueta Beach. Alcazaba and Port of Malaga are also within 15 minutes. La Malagueta Station is 8 minutes by foot and La Marina Station is 12 minutes. 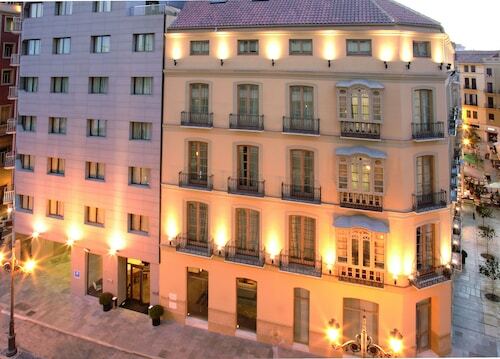 Located in Centro, this hotel is steps from Fuente de Genova, Plaza de la Constitucion, and Malaga Cathedral. Carmen Thyssen Museum and Palacio Episcopal are also within 5 minutes. La Marina Station is only a 5-minute walk and Guadalmedina Station is 13 minutes. Malaga Centro places guests close to culture, 5 minutes on foot from both Malaga Cathedral and Casa Natal, the birthplace of Pablo Picasso. Sun-seekers can drive 20 minutes to the sandy beaches of the Costa del Sol, while history buffs can explore the Moorish sights of La Alcazaba. 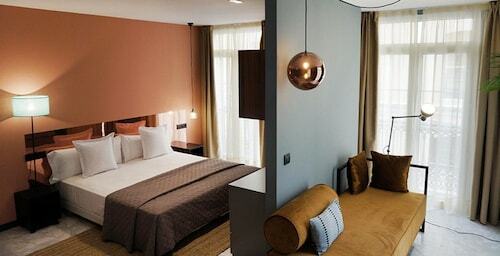 Located in Centro, this boutique hotel is steps from Mirador princess and Port of Malaga. Malaga Cathedral and Picasso Museum Malaga are also within 10 minutes. La Marina Station is only a 2-minute walk and Guadalmedina Station is 12 minutes. 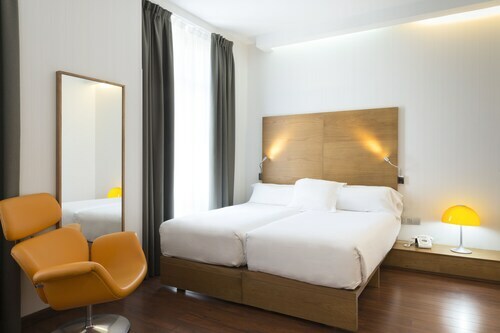 Located in Centro, this boutique hotel is within a 10-minute walk of Central Market of Atarazanas, Port of Malaga, and Calle Larios. Malaga Cathedral and Picasso Museum Malaga are also within 15 minutes. La Marina Station is 5 minutes by foot and Guadalmedina Station is 8 minutes.